The Gascoigne family & the people associated with them. Gawthorpe and Harewood are extremely close together; view the map on the Ordnance Survey here Gawthorpe according to a reference in the book titled, "The Building of the English Country House" ISBN: 1-85285-556-8, is covered by the lake at Harewood House. The old manor house, Gawthorpe Hall was in a damp hollow besides a tiny tributory of the River Wharfe. Harewood House by J. M. W. Turner circa 1800. The lake in the foreground. The junior branch of the family, headed by Nicholas Gascoigne, acquired the estate of Lasingcroft in 1392. This was to remain the family seat until the sixteenth century, when Richard Gascoigne purchased the estate of Barnbow not far from Leeds. This in turn was to be surplanted by Parlington. Set due west of Aberford, the Parlington Estate had been bought by Richard Gascoigne's father John from Thomas Wentworth in 1546. Therefore it is not surprising that some years later Sir Thomas and others were accused of a conspiracy to overthrow the monarch Charles II. The following is an extract from 'Edmund Bogg's book of The Old Kingdom of Elmet' pub.1902 Barnbow and Shippen was the scene of the supposed Popish plot, where Sir Thomas Gascoigne and others assembled to devise means to overthrow the Government and re-establish the Roman Catholic Faith. Regarding this plot there is a printed pamphlet, now very scarce, entitled 'The narrative of Robert Bolron, of Shippen Hall, Gent., concerning tghe late Popish plot and conspiracy for the destruction of His Majesty and the Protestant Religion.' Bolron, the accuser was steward of Sir Thomas Gascoigne's coal mines and dwelt at Shippen Hall. 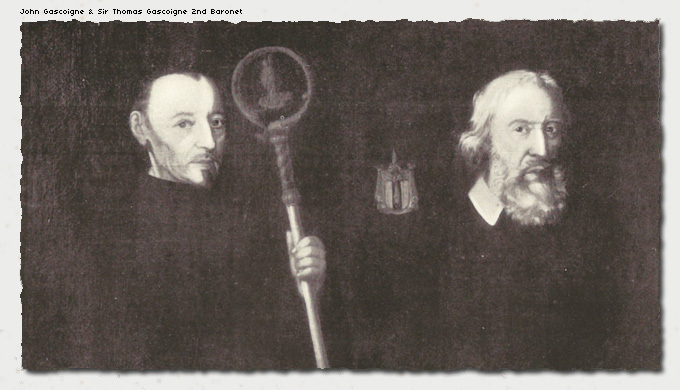 He had been brought up in the reformed faith, but, on taking service under the squire of Barnbow, he became a Roman Catholic, and he seems to have changed his faith as easily as his coat. His surviving son succeeded him but died without an heir, whereupon the estates passed to his two nephews in turn. The elder, Thomas, 4th Baronet, who is said to have conformed to the established church, also died without heir, leaving his estates to his brother. 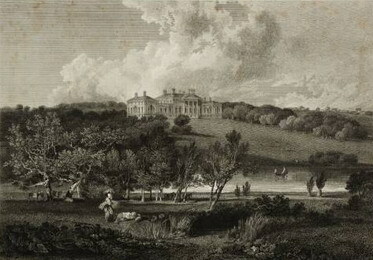 In 1723 the lands were inherited by Edward Gascoigne, who became the 6th Baronet. Parlington Hall is the main emphasis of this site, the Gascoigne family who controlled its destiny are considered in the context of the Hall from the time of Sir Edward Gascoigne until the death of Sir Alvary Gascoigne in 1970. The Gascoigne family tree has been re-drawn to better demonstrate the lineage through to modern times, please click on the small image below for a full size family tree. The Roman numerals after the name of the key individuals are the position in the full line back to William Gascoigne at about the time of William the Conquerer 1067. 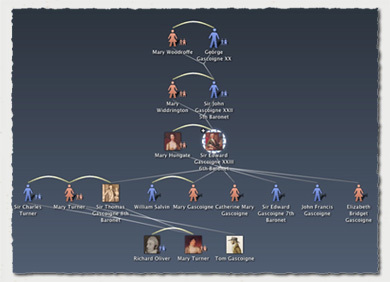 The key individuals are ringed in each of the three family tree charts, starting with Sir Edward Gascoigne. In the second chart, the Gascoigne bloodline ceases at the death of Sir Thomas Gascoigne in 1810, Mary Turner, Sir Thomas's stepdaughter and her husband Richard Oliver continue the thread through their eldest daughter Isabella and her husband Frederick Trench. The final chart continues the tree but leaves out the latest generation. Another mechanism for viewing the Gascoigne family and Parlington Hall events is to view the Timeline event window, this is an adaptation of the M.I.T. 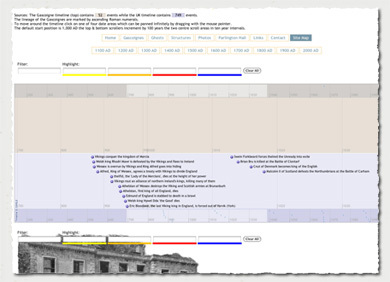 (Massachusetts Institute of Technology) project called Timeline click on the image below. Other writers have focused on the Gascoigne family, often choosing one member of the family for consideration, a particularly good description of Sir Thomas Gascoigne formed the dissertation by a student at Leeds University for his M.A. Also a manuscript on the gardens at Lotherton Hall, covering the early twentieth century may become available here subject to future approval. To increase space for the Navigation Buttons, the graphic "Parlington Hall" at the head of the page is a link which will return you to the Home page. Or click Home here. To assist in the legibility of these pages I am introducing a comments system, which takes the form of the icon with an identifier of SHOW or HIDE . These are to add contextual references to the copy, which may need additional explanation. Within the main column are occasional references marked like this  which link to this notes column, to return to the point in the body copy click on the [Back] link. The new site adds considerably to the content about Parlington, but until the whole site has been redesigned some sections may be unavailable on the new site, to overcome this problem, you can visit any of the old pages by clicking on the icon below to show the original site navigation.